Pols and activist groups gathered Monday at City Hall to advocate for the Dream and Promise Act to pass in Congress, which would protect so-called Dreamers and other illegal immigrants with temporary protected status and provide a path to citizenship. “This act would mean so much for me and my family and it would help more than just me,” said Karina Ham, a Lesley University student who was brought to the United States when she was 4 years old and said the Deferred Action for Childhood Arrivals program has provided a valuable opportunity or her. Under the bill, the so-called Dreamers — illegal immigrants who were brought here as children — would have conditional permanent resident status for 10 years with the option of permanent resident status if they receive a bachelor’s degree or serve in the military, and give permanent resident status and other protections to people with temporary protected status. “This coalition represents the best of the commonwealth and the best of the country and we hear your call for justice,” said U.S. Sen. Edward Markey. Speakers at the rally slammed President Trump, saying he is using the illegal immigrants as a bargaining tool. In Massachusetts alone, there more than 12,000 people with temporary protective status, 5,900 active DACA beneficiaries, and 13,000 Dreamers who were eligible for DACA but were not enrolled when the program was ended, according to the coalition. 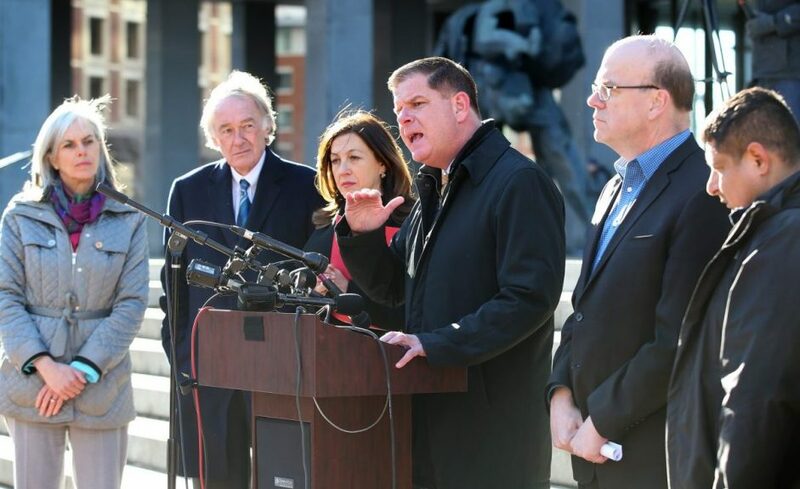 Walsh said that 28 percent of Boston is comprised of immigrants. Several men stood on the sidelines of the rally shouting “do it legally” and “our forefathers fought for our country.” They stopped shouting after police went to speak to them. Read the original story in the Boston Herald, here.